Unlike most western dance, California Native American Dance is not a performing art designed for an audience. Rather its a religious and prayer ceremony, usually only performed in a ceremonial roundhouse where photography is never allowed. Some tribes may allow photography outside of the roundhouse while others do not and I was very fortunate to be the only photographer granted permission to shoot these events. As a result, at present, these images are not for sale but are only used for educational purposes to display some of the beauty of the native people traditions of the west coast. These were all shot in the Yosemite area or in the Yosemite Village and represent predominantly Sierra Miwok and Maidu people. 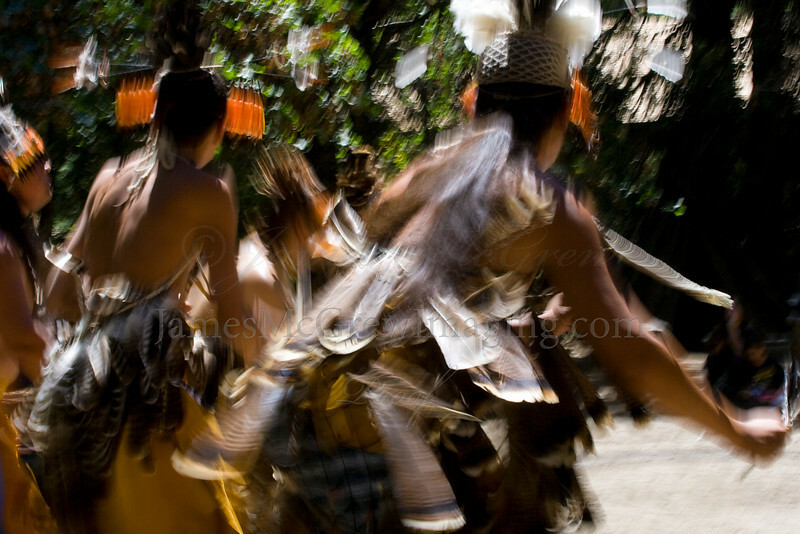 Many of the images are blurred to represent the trance like state in which the dancers immerse themselves during a ceremony. To help distance themselves from the physical world, the men wear blindfolds made of the brilliant orange feathers of the Northern Flicker.